The weather was perfect this weekend for just staying indoors and tackling some projects. It wasn’t too cold but gray, foggy and sometimes rainy. So I decided to finally get my studio in order. Throughout the past year I’ve organized here and there but I think a lot of times that just meant clearing off my craft tables and not really doing a deep purge. I’ve filed away my stencils and stickers. Now I need to put away papers, and I also want to get rid of magazines that I don’t need anymore. Oh so much more to do. I don’t think I’ll be done with this project for a while but at least I really do feel like I’m making progress even if my studio/library is a bit of mess right now. Aside from that this weekend I’ve made more progress in The Woman Who Walked in Sunshine but I’ve been tempted by the latest issue of World Literature Today which arrived in my mailbox this weekend. What have you been reading today? Sounds like a productive day! I’m still in the process of putting my guestroom/office back in order after having it painted over the Thanksgiving weekend! Time to go through the books one more time and figure out what I can live without before I have to start packing for our move this summer. Not much reading this weekend. Still recovering from the plague! Sounds like you’re off to a great start! I have to do some organizing in the study side of my bedroom. Looking forward to a free weekend so I can get that going. I can’t wait to see what you make this year! 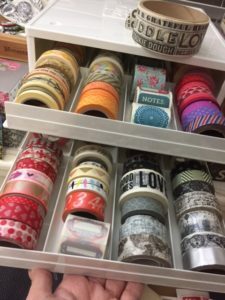 Drooling over all your washi tape! I don’t have enough that I need a big organizer, I keep mine on an old paper towel tube sitting on end. Though the tube is full and if I ever get more, I will have to find another way to keep it all tidy. I hate the work of organizing but I love having things organized. Oh, I’ve never thought of subscribing to that one. What better way to add to your TBR. Enjoy!